42 Coleman Rd. Beautiful home with colorful history and good plumbing. Friendly neighborhood. Dining room ideal for birthday parties. Safe for pets. The British television station Channel 4 lists a moment from this television episode in their 100 Scariest Moments show (it came in at #50), and this month, we’ll see how the Down Placers rank “The House That Bled to Death” from the series Hammer House of Horror among Hammer’s movie output. Also, the guys go over some listener feedback, and eventually veer so off-topic that they end up talking about . . . Universal? 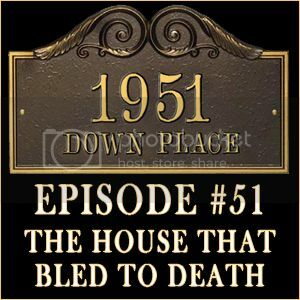 Download 1951 Down Place: Episode #051 here!